George Ryan from Cops Plus here, and I want to talk to you about holsters. There's many options out there, but there's three that I want to specifically touch on and give you some pros and cons to help you make a choice to see which one's best for you. On the table here we have three choices, we got a belt loop holster, we got a paddle holster, and we also have a concealed carry inside in the belt holster, or inside the pants if you will. Let me start with the belt holster and just go over some pros, some cons, some key features that you want to consider when making a choice. This belt loop holster here, as you can see, attaches to your belt. You got two basic holes right here and you're going to find the spot, if you're a righty or a lefty, that fits comfortably on your pants. As you can see on your pants, you have belt loops here that are going to be a big consideration. Attaching your holster is just like putting a belt in your pants, so you're going to go ahead weave the belt into your pants, weave that in the one hole here, behind the holster, through the other, and then secure your belt tightly so it fits snug on your side. Considerations to think about with this belt loop holster is that if you have to go inside or outside of a vehicle, or just basically sit down, this might actually dig into your side if you're crouching. If you're sitting inside of a vehicle that has a tight space, you can only adjust this belt loop holster as far as your belt loops will allow you to. Now that you've got some features about the belt loop holster, I want to move onto the paddle holster. The paddle holster's very popular out there because it's convenient. 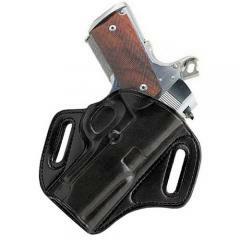 That's one of the features that makes it an affable holster. 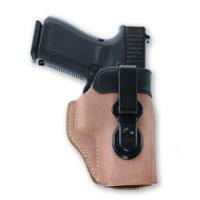 Unlike the belt loop holster, you can basically place this thing wherever you want to place it. If you're a right handed guy, you can go ahead and clip this paddle on the inside of your belt and slide it on, it's going to sit there nice, snug, and secure, and considerations on that are it kind of sticks out a little farther than the normal belt loop holster, so if you're trying to conceal with a shirt or place something over top, you're probably going to see the outline or silhouette of your weapon system so just keep that in mind. The paddle holster gets its name because the clip is actually shaped like a paddle and it's used to actually clip it onto the user and keep it securely in place. Because of that paddle it makes it a really convenient holster in that sense that once it's clipped in, if you have to get in or out of a vehicle, you can just go ahead and slide it in your belt seam to where you need it, the small of your back, maybe you got to put it in the front, and that way you can be comfortable while performing your patrol duties. If you have to go to a federal building or you're performing court duties, what's really great about this is that if you have to give your weapon up, all you got to do is pull it out, you don't have to worry about your belt loops getting in the way just like the belt loop holster. Really quick and convenient, pull it out and go. 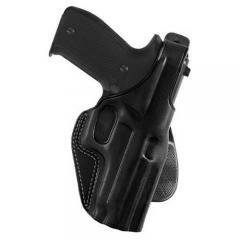 What I really like about the paddle holster is, unlike the belt loop holster which is nice and snug to you, it's going to stick out a little bit, and the advantage to that is it's not going to dig into your leg when you're sitting in a vehicle and also it's not going to go ahead and crimp you if you're sitting in a seat or just in a weird position, making it comfortable. If it does, all you got to do is slide it. It's pretty cool. Moving on to the last holster, it's the most conceivable, and this is the inside the pant holster. This is a very good holster because it's convenient and it gives you the least amount of silhouette on your weapon system. That being said, you're not going to carry a full sized Glock 17 or comparable duty weapon system, got to have a compact weapon system that's small, and this is the reason why. You have this clip here which is going to go ahead and attach to your belt seam, and you want a nice compact weapon system because once you actually attach it, the profile's going to be small. If you had a big weapon system, it's going to dig into your torso, it's also going to dig in your leg making it really uncomfortable. The advantage to this system is that you can take it anywhere, low profile, no one knows you have to have it, and it's convenient. To sum it up, for belt holsters, these are three solid options. When choosing one, make sure that you understand what you're going to be doing with the weapon system so you can make the right choice. I'm George Ryan for Cops Plus, hope you enjoyed it.